My eyes are slowly being opened to a new vocabulary, at least for me, that I read in the comments, talks and speeches that Benedict XVI uses when addressing the public. MADRID (The Blaze/AP) — Pope Benedict XVI denounced the profit-at-all-cost mentality that he says is behind Europe’s current economic crisis as he arrived in hard-hit Spain on Thursday, and said morals and ethics must play a greater role in formulating economic policy in the future. Benedict made the comments as he traveled to Madrid for the Catholic Church’s World Youth Day, a weeklong Catholic festival that is taking place against a backdrop of the European debt crisis and social unrest among the young that exploded recently in the riots in Britain. It's not that the vocabulary is new, it's just that I'm now becoming more aware of it through my read of Brian Benestad's book 'Church, State, And Society - An Introduction To Catholic Social Doctrine'. I'm doing some studying on Catholic Social Doctrine. It seems to me that so many people, in the media especially want to tell us (Catholics) what Catholic social justice, social doctrine is or should be, that it's confusing the heck out of Catholics in the pews. And let's face it not many of the pew dwellers want to take time to do a little studying or at least looking into what the Church actually says. I haven't run across too many homilies either that explain this teaching. Granted 10 minutes at mass isn't enough time but B16 gives some wonderful brief talks during his weekly audiences. You can find these talks compiled in books if you've missed them. He's talks on the Church Fathers in one of my favorites. I'm finding it a little difficult myself with 10 hour work days, a 3 to 4 hour commute to and from, two grandchildren vying for attention, and my wonderful patient wife waiting her turn to catch a few minutes with me. So I can empathize with finding enough time. I know my schedule doesn't compare to some out there with even busier life schedules. But let's face it, as Catholics our knowledge of our faith doesn't end in CCD. I've heard so many fallen away Catholics say "I have 12 years of Catholic education under my belt and I'm still not convinced the Catholic Church is the true faith". Let's be real about this. They're talking about elementary, middle and high school education in the Catholic school system. Along with the essentials of an education (math, reading, writing, science) they may teach a few prayers or the basic tenants of the faith, God the Father, God the Son, God the Holy Spirit. They may teach "Love God with all your might, all your strength, with all your mind and Love your neighbor as yourself". But my guess is they didn't go into a deeper understanding of these two golden rules into the realm of 'Common Good' in regards to Catholic Social Doctrine. I myself attended the Minor Seminary for four years and I only began to start studying my faith with any substance until I left the Seminary life for my calling as a husband and father; ten years into married life. I'm still only scratching the surface after 29 years of marriage. And I'm loving every moment of my continued study of the wonderful Catholic faith. So when I picked up this book by Benestad it really is giving me a better understanding of Catholic Social Doctrine. With regards to Pope Benedict's point of "morals and ethics must play a greater role in formulating economic policy in the future", it's beginning to make perfect sense. So many times we are told that we must give the 'instrumental' needs to the poor and needy. Instrumental meaning food, shelter, clothing etc., but not much emphasis is given to the true definition of Catholic Social teaching and that along with the instrumental giving there must be 'substantive' (Benestad, Church, State and Society, pg 82) part of that giving. Substantive meaning the promotion of "virtue in the lives of every individual, while preserving or establishing good mores and institutions"
This is what B16, I believe is talking about. He sees the tragic happenings throughout Europe and especially Great Britain with regards to the riots and recognizes that there is NOT this promotion to virtuous living. The State can not just give the food shelter, jobs, clothing and whatever else without an instruction to it's citizens to live virtuous lives. 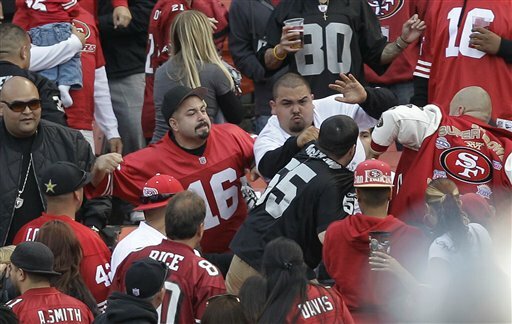 The Raider/ 49er melee this weekend is just another example of the loss of virtue in our society. This picture says it all. Everyone carrying beers, looks like an infant or toddler being held in the crowd and no one cares. There seems to be more violence and disregard for “love thy neighbor as thyself” and more a “love myself more than my neighbor” mentality today. That ‘love myself’ mentality is flowing into every niche of society. Even in the way we think of Catholic Social doctrine. There seems to be more of an emphasis on the ‘instrumental’ side and less of the ‘substantive’ side of the teaching. Sometimes we may think that in giving only, we can solve the problems of poverty or injustice. And while I agree that we should give as much as we can, there should also be the other side of that coin in that those that receive have their ‘duties’ to perform. We hear so much about ‘rights’ and not enough about ‘duties’. I think it most important to know what Catholic Social Doctrine is and what it's not. With the elections coming up it's no secret that political Left as well as the political Right will once again try to convince Catholics that they know the faith better than we do. We as Catholics should be aware that we are Not Left or Right, Liberal or Conservative, Democrat or Republican. We are members of God's family through baptism and we must be the light in the world we are called to be. That means to know your faith and able to explain it without fear at all times. Living here in California is not an easy place for doing that. The thought here is 'keep your faith on Sunday', and I mean at church not at the football game or at the office and definitely not in the voting booth. Some have lost the will to battle the forces against the church. Especially when we seem to be battling our fellow Catholics who have their own ideas on what the Catholic Church is. Catholic Social Doctrine is one of those subjects that is raging in many parishes today. Political groups are infiltrating our parishes. At my parish a group called UCIC has been invited into our Youth Group by the pastor, endorsed by the Bishop. It's a group bent on defining Catholic Social Doctrine on their own terms for their own means with a definite political agenda. That's why it's important to study your faith. That's why I'm studying what the Church teaches on Social Doctrine. One must know the vocabulary and terms and teachings. Through the encyclicals, the Catechism of the Catholic Church, the Church Doctors and saints. For a great intro into Catholic Social Doctrine, Brian Benestad's book is a good place to start.